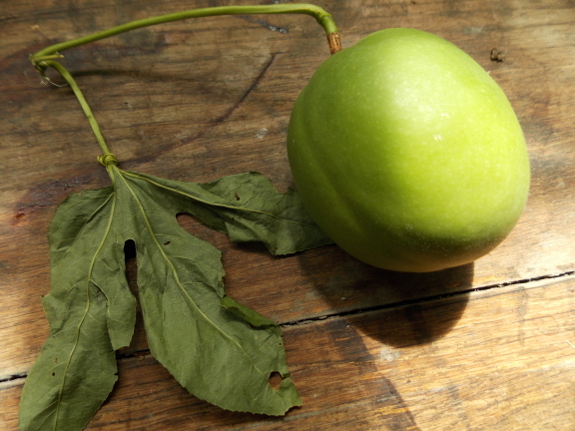 One of Mom's friends gave her this unripe passionflower fruit, which she then passed along to me. Since the maypop is edible and the vine is often included in permaculture texts, I might see if the fruit had gotten far enough along on the vine to produce viable seeds. I'm always up for growing an experimental species, even though I have a feeling that, if maypops tasted all that good, I would have eaten one before since they're native to our region and since I grew up amid foragers. In the meantime, I'd be curious to hear from those of you who have grown passionflowers in your garden. I know the blossoms are beautiful, but is the fruit worth eating? I couldn't get past the smell. We did plant some seeds this spring and the vines are popping up 15 feet from where we planted them. If the pods yellow this year we will try them but we have not had any make it that far. We have a ton here (eastern nc). They grow wild all over our ditch banks and climb up our pasture fences. The flowers are beautiful but we've never tried the fruit. Ive heard there are several varieties and some aren't edible. I haven't researched enough to know what the differences are so I'm curious to hear what you find out. We grow the black passionfruit here in CA, and I LOVE it! Super fragrant and delicious. It is the most low maintenance edible that we grow. It's a vigorous vine, so we just have to hack it back a little where we don't want it and that is it. Just got this fascinating comment via email: "We used to cook the seeds with just a little water and then strain out the seeds to make passionfruit syrup to put in our iced tea (or it would be awesome in just about anything) when we lived in West Africa. I live in Montana now, so we don't grow them here. The vines attract snakes unless well trellised (at least in Africa they did, but based on your snake adventures, I bet they would there, too), but the vines are wonderful shade-makers and flowers beautiful." From this, and a comment on facebook, I'm suspecting that drinks are the primary purpose of passionflower fruits. I've never grown passion fruit in the States since I live in Oregon and it's not hot enough here to get the vines to fruit. I do remember in Africa I would just pop open the black fruits and eat the tart, fragrant seeds. So yummy and flavorful!! Tons of vitamin C! They're much like eating a pomegranate in that there isn't much "fruit" to them, just mainly seeds encased in yummy bits. Delicious added straight to fruit salads or yogurt. Many people would squish and strain the pulp away from the seeds and make fruit leather or a drink concentrate to make into juice with sugar and water added, much like lemonade. Very true about snakes in my experience (green mambas were notorious since they blended with the vines), but not sure that would be a huge problem in your neck of the woods, especially with a fog and cats about. I'd say give it a try for sure!! At the very least, it's attractive shade foliage. I tried maypops for many years, and they only managed to set fruit twice. The fruit was pretty bland. Not bad, but really not much there. But actual passionfruits- I love 'em! I grow them in an earthbox and take them inside for winter, drastically pruning them. They semi-hibernate and then grow like mad in the spring. They will turn purple and drop from the vine when almost ripe, then just let them finish up on the kitchen counter. When the fruit gets just a little bit wrinkled, they should be ripe. Cut them in half, stir up the insides with a spoon and enjoy over shaved ice. Also goes well with yogurt, or use the half fruit as a cup- add some soda water or if you prefer, vodka. Passionfruit is a cultural staple here in Australia! We traditionally grow them over the chookhouse, the dunny, the fence, or the shed roof. Pretty much any vertical structure will do :-). You can't make a good pavlova without passionfruit! It's also used in "tropical" fruit juices and as a flavour in some softdrinks (in particular my childhood favourite, Passiona). It sounds like maypops are a slightly different variety, but I've no idea how different the fruit is. In Tanzania they put it in a juice mixture with mangoes and avocado. It gives a slight tangy taste and a delightful distinctive smell. 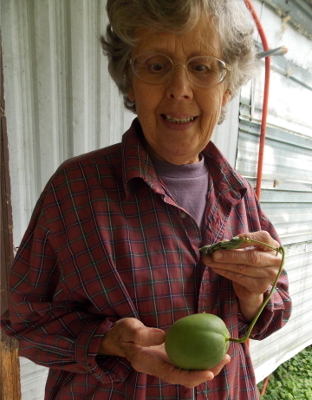 Maypop - Don't eat under ripe! I have been amazed at the number of people I see who eat maypop completely under ripe. In North Carolina the variety that grows wild has a green fruit, but when opened up under ripe the flesh and seeds are white and don't taste very well at all. You should wait till the fruit is REALLY wrinkly and then the flesh and seed are more orangy and tastes deliciously sweet. This is how we always ate them in Asustralia too, let them go wrinkly! That may not work for commercial sale as most people would think that the fruit has gone bad, but MUCH better in taste that way! !